Catherine Sheldrick Ross is one of “my tribe”. She is a librarian scholar and researcher of readerly people at Western University, Ontario, Canada (well actually, she is a professor emeritus of library and information science). I first came across Ross upon reading her paper “Reader on Top: Public Libraries, Pleasure Reading and Models of Reading”. Ross, in her paper discusses the child series reader, the romance reader, pleasure reading, reading as a ladder and what I found particularly striking, is the anxiety that librarians feel in promoting reading that is not considered by literary standards to be “the best”. Early on in my candidature, I had to make a decision as to whether I will focus my research on romance fiction or on romance readers and, due to Ross’s research I felt challenged. I deeply loved the idea of exploring readers but, for reasons I won’t go into here, I eventually chose to focus on romance fiction instead. However, Ross’s research remains important to me so I seek out her writing. Having read many of her papers and her book Reading Matters, when The Pleasures of Reading was published last year, it immediately hit my TBR. And it did not disappoint me. It was so wonderful that I read it in the space of two days (somewhat of a feat for me with non-fiction). I love that Ross uses equitable, non-judgemental descriptions for her readers such as omnivorous, avid, self-improving, eclectic, selective, aspirational, efferent and aesthetic reading, discriminate, indiscriminate, selective, superreaders, voracious and so on. I find myself categorising my own reading according to the descriptors that Ross uses. I think of my own reading and choose the descriptors that suit me. I am an aesthetic reader. I am a selective reader – many people would think that reading copious amounts means you are indiscriminate. There are people in this world that will read anything that comes their way. This does not describe my reading. I am picky. I could be in a library or a bookshop and struggle to find a title that interests me. My romance reading is particularly discriminating. I seek out specific tropes, specific authors. I have phrases that render a book unreadable, I need convincing to tackle a doorstop tone. I love sparcity in writing. But I will try many books in my search for the perfect read. As a librarian, and working in customer service, I have to keep myself in check when a reader of Important books requests assistance. I tend to avoid reading books that win prizes and medals and have gold stickers on them. These books rarely interest me, they make me feel as though I am an outlier and that I am only person that does not see the writing that others applaud. But this means I still need to be familiar with Important books as I am the professional that needs to navigate people to the books they find joy in. Ross discusses the anxiety that critical authorities feel when they see people embracing cheap books or books they do not value and the impact this has had over the years to the reader. This book is a discussion of the many elements of readers advisory librarianship and all it entails. Though it is a professional publication, it is highly readable and would be of interest to anyone who wants to explore different types of readers and reading styles. Ross quotes Mortimer Adler who said “The marked book is usually the thought through book” and my photograph of my book is certainly an indication of the connection that I have had with this book. If this book had been mine, I would have marked every page. I would have had a discussion with Catherine Ross that she would never know it. 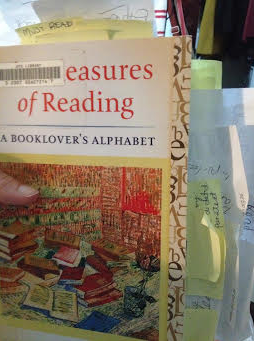 Instead, my library copy is thick with post-it notes. This book IS the librarian model that I am. This is the how so many in my profession model themselves alongside and I think all in the library profession would feel totally validated by the publication of these serious, yet simply stated ideas. This existence of this book makes me happy! The copy of the book I read was borrowed from my university’s library. I discovered it by searching for Catherine Sheldrick Ross on the catalogue. I love that phrase, “the serendipity of arbitrariness” and the idea, consequently, that, like people, books are created equal. Which is exactly why I’m doing my research. Romance fiction is definitely not treated equally and is often separated from the other fiction in library collections.